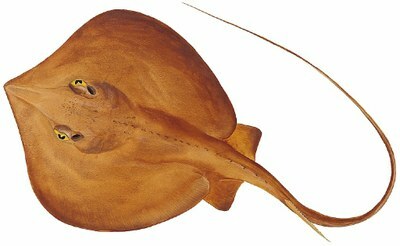 Stingrays are a bottom-dwelling, flat fish that live in salt water. Like sharks, stingrays are cartilaginous, which means, they have cartilage instead of bones. They also have a sharp barb on the base of a long tail that is capable of injecting poison. Most stings are usually delivered to a leg or foot when someone steps on a stingray while walking in shallow water triggering the reflexive response of the stingray. Stingrays eat worms, fish, crustaceans and mollusks. The stab of a stingray barb is characterized by immediate intense pain in the area of the wound and some blood loss. Severe allergies are rare but do occur. Stingrays are not aggressive and will only attack if threatened. The best way to avoid being stung is to shuffle your feet when you walk in surf or shallow bays where they live. That way, you give the stingray plenty of time to get out of your way and you don't bring your foot down on top of one. Stingray poison is heat sensitive, which means, it is neutralized by very hot water. If you are stung, submerge the wound in water as hot as you can stand, and the pain will subside very quickly. Medical attention should be sought afterwards because the barbs can frequently break off in the wound and need to be removed. Secondary infections can occur and Tetanus shots may need to be administered.